I’m going to assume you’ve written a wonderful book. Because without that, seriously people, there’s no marketing magic in the world that will make people love your book. And loving your book is a key ingredient to selling your book because word-of-mouth is only grown out of love. So a great book is a given. 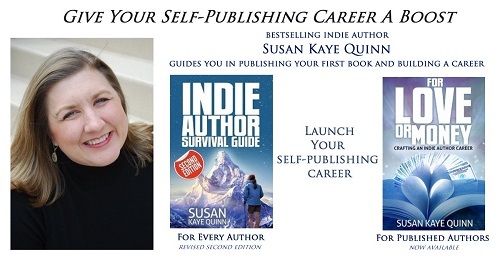 This section covers how to take that great book and publish it well. How to create a beautiful package (or backpack to carry it in), lots of tips on using all the tools available to launch it well, as well as a strategy for gathering up those treasured readers and treating them well. But first I want to address something I see over and over again: a sort of reflexive revulsion when it comes to marketing, as if you’re a used car salesman hawking a 1972 Pinto. You have a great book, right? Give it the marketing it deserves! That starts with believing you have something worth the reader’s money. Say the word “marketing” or “sales” and people’s eyes automatically glass over. Or they shudder. Images of robo-calls and snake-oil salesmen in ugly jackets spring forth. At the prospect of having to market their book, many authors cringe, even as they steel themselves because it’s one of those necessary evils. They just loathe the idea of being one of those people. Well, good grief, who wouldn’t? This is a cultural stereotype, one that can be difficult to get your brain past. Rule #1 in marketing: if you hate it, everyone else will, too. So, take a deep breath. If you’re doing something that makes you shudder, I can almost guarantee you’re doing it wrong. There are a thousand right ways to market. Just like your books, the way you market will (or at least should), be individual to you. I’m constantly surprised how amazingly creative people, ones who can dream up fantastic worlds and create incredibly life-like characters out of thin air, insist on doing what everyone else does when it comes to marketing. You’re a creative person! Bring it to your marketing. Mostly I think this is a faux humility. Or perhaps a fear that we will be found out as writing hacks. Address those fears separately (see How to Be Brave), and shuck off the fake humbleness. You’ve put a lot of hard work into your novel. Value it for what it is: several hours of entertainment that may move hearts or make people think (if you’re lucky and have done good work). There are readers out there who will enjoy what you’ve created! This an amazing and good thing. If you have enough faith to publish, then have enough faith to give it the marketing it deserves, so it can find its audience. So if you’re not selling your book on social media, do you need to be on social media at all? (MAYBE; it’s optional) And how does a book get sold if not on social media (LOTS OF WAYS)? THE BIG IDEA: Book sales generate social media presence, not the other way around. Once you understand this, then you don’t have to worry about having a social media presence before you launch your book. Launching your book, selling your book, will generate readers who love your book, who will then seek you out on social media. Once you have that happen (even if it’s just two readers), then you can deal with the question of “what should I do, as an author, on social media?” (Hint: it’s not spamming Facebook groups with your books or tweeting your book a hundred times an hour). Being accessible via social media is a hallmark of all entertainers today… and that’s what you are. An entertainer! When people seek you out on social media, they want to connect with you, the author, but they also want to be entertained. Whether it’s a quippy FB post or a fun twitter share, you should be flexing your creative muscles when you’re on social media. You’re a storyteller! You should be doing this all the time. (Here’s one of my favorite parts about marketing as a creative person: if you’re doing it right, it builds your creative muscles, because you’re using them in all kinds of situations, not just your stories). Entertainment is always appreciated. Think about the videos and FB posts and silly cat pictures you share—you never think “oh there that person goes again, saying look at me!” You enjoy the content, share it, and appreciate the bright spot of fun that person has brought to your day. While most of your time on social media will basically be you having fun with your readership, it’s completely legit to share book news. In fact, readers want to know when you have a book coming out, so this shouldn’t be any great surprise. But even if you’re not on social media much, you can still use it as an easy platform for your readers to share your book news. For example, my penname is hardly ever on Facebook, but she does post on her page about book releases when they happen… and those posts get shared like crazy. How does that happen? Well, penname keeps a newsletter, which is her main way of contacting her readers. When she has a new release, she puts a link in her newsletter to a Facebook post with a nice, easy-to-share graphic on it and asks people to share. And they do. Because while penname isn’t on social media, her readers are… and they like to share. Under my SKQ penname, I do much the same (here’s an example), although I interact with readers a lot more under SKQ, which is also where I primarily network with other authors. This is the biggest advantage of social media, in my humble opinion. The facebook groups that I’m in with other authors have been immeasureably valuable. 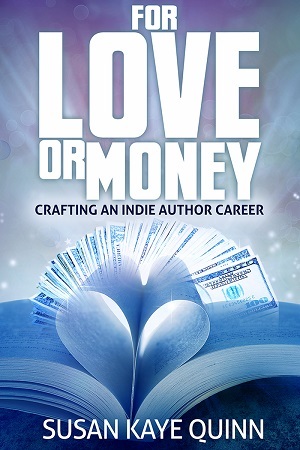 (Hey, I even started one of my own for authors—join us over at the For Love or Money indie author group!). This is not a place to ask for reviews or post your book sale… this is where you learn the tips and tricks of how to actually sell books. 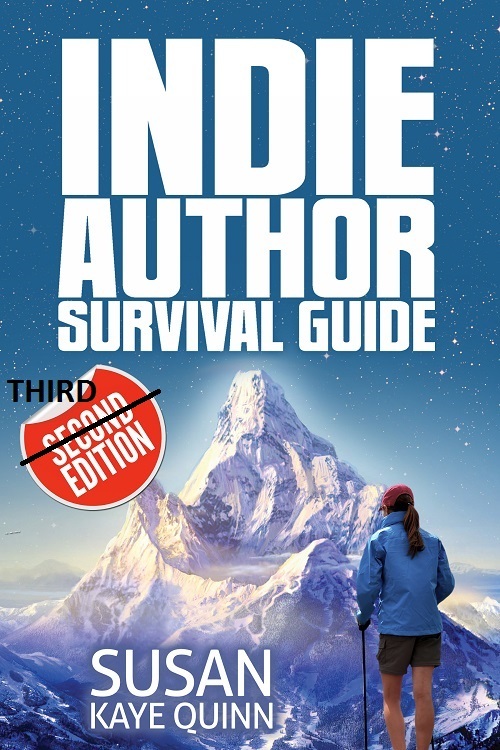 From the people who are running the experiments, keeping up on the industry, and generally stirring the cauldron of innovation that is the awesome world of indie publishing. This networking is indie publisher’s superpower. Seriously, we are better connected, faster moving, freer with sharing information, and more hungry/eager to try new things than the traditional publishing world. It’s what tips the balance in favor of indie publishing in most situations—a vast network of professionals hip deep in the market and running their businesses, helping each other out. Okay, so social media is for hanging out with readers, sharing book news with the people who are already your readers, and networking with other authors. Cool. But then… if I don’t actually sell books on social media, how do I sell books? What About Blogs? Shouldn’t I Have One? I started out blogging in 2010, back in the heyday of blogging, and this book originally grew out of that. Today, I hardly ever blog (although I make an exception for blogging my way through the Third Edition of this book, just because it’s an easy way to share). Blogging is still a thing, and I still have people coming to me and asking if they should start a blog to build audience before they publish. If you’ve read this far, you already know the answer: no. Think of it this way: any time you’re asking a reader to spend time reading your words, would you rather have them reading your book or your blog? If your answer is your book, then working on building a blog audience is at cross purposes to that. Of course, it’s possible to have an uber-popular blog that generates sales for a book… it’s just an incredibly time-consuming way to go about things. Test this out for yourself: think of a blogger that you really like to follow. None? That’s the answer of most people. But say you do have one or two—I’ll point to David Gaughran’s blog as one that I seldom miss. Why? He’s brilliant and always has great indie publishing news. Next ask yourself: do you buy this person’s books? No? That’s the answer for most people as well. In my case, I actually own David’s Let’s Get Digital and Let’s Get Visible. I do not own any of his historical fiction. Why? Because non-fiction experts with a blogging platform are the people who sell books based on that platform. Fiction authors do not. I follow David for his indie publishing expertise, so those are the books I will buy. Where do I get the recommendations for the fiction books I read? A wide range of places, but definitely not from following blogs. And I’m an author who’s highly aware of blogs! For your average reader, the discovery mechanisms are 1) word of mouth, 2) social media like Goodreads, and 3) a billion other online places like Amazon emails, Bookbub ads, also-boughts, bestsellers lists, etc. The number one reason people buy a book? Because they already know and like the author. Get your books written and in people’s hands… the best marketing in the world is your own books. 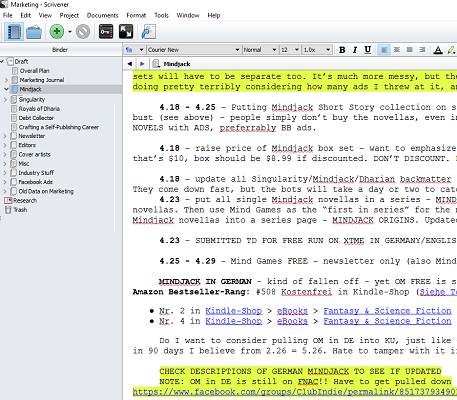 In case you can’t read all my junky notes, there are things in there about putting my Mindjack Short Story Collection on sale, and updating backmatter, and submitting for ads, and running a 5day free run with one of my books. Also organizing a series for my novellas, promoting my German books with a German-specific ad, considerations of permafree vs. Kindle Unlimited… and that’s just the second half of April for one series! I’ve got folders for each of my series with detailed plans for months ahead of time. I’d say the bulk of my marketing time is spent on making plans like this, scheduling ads for my promotions, and building my newsletters (because that can take serious time… I like having pretty newsletters!). Zero percent of this time is “spamming social media with my book.” A tiny percent comprises the time when I mention my books on social media. We’ll talk more in the chapters ahead about the details of things like whether you want to be in Kindle Unlimited and how you use Paid Advertising, but suffice to say at this point, that “marketing” is the total package—from the creation of the cover to getting reviews to buying ads, having a cohesive plan to get your books out in the world is what marketing is all about. And you wrote a great book, remember? So give it a thoughtful plan for finding readers. And no part of that should make you feel like a slimeball. Make it easy for people to find your books. That means having a link to your website to your Facebook page and a link on your Facebook page to your website… and somewhere in there, links to your books as well. It frustrates me when I want to hunt down an author’s work and I can’t! For serious. If I want to know about your books, for heaven’s sake don’t hide them. And have easy click-through links, a quick blurb or tag line, something that makes it simple for me to buy. Don’t make me work too hard to find your books. Don’t feel like the massive weight of success or failure hinges on every promotion you do. There’s a tendency to think that if you don’t do everything exactly, perfectly right, and OMG you forgot to post on booksforsale.com, that now your book is doomed, doomed, doomed. Or that if you could just figure out the secret marketing ingredients, your book will shoot to the top of the NY Times Bestseller list. This is the kind of thinking that makes people hyper-focused on trying to sell their book, rather than moving on to write the next one. This is lethal to your writing career. Don’t do this to yourself. Either your book will find its audience or it won’t. Either you’ll sell well or you won’t. There is no magic marketing gimmick that will make people love your book. Have fun with it—make it beautiful, toss it out there, share it with your friends, do some silly stuff with it, then move on to the next one. You’ll always have a chance to reboot it later if what you’re doing doesn’t work the first time. Ok, now that we’ve got you in the right frame of mind about this marketing thing, we’ll talk about exactly how to make your book the most beautiful girl at the prom (or the most dashing hero storming the beach) and how to think like a businessperson and not just an author.